﻿ Jurassic World Plot Spoilers: New Bad Dinosaurs to Fight against Good 'T-Rex'? - Zigong Dinosaurs World Science & Technology Co.,Ltd. New juicy spoilers about the dinosaur movie Jurassic World, better known as Jurassic Park 4 have started flowing in from the sets. The Colin Trevorrow directed science fiction movie is slated for a 2015 release and is based on the same theme as that of the first Jurassic movie. Jurassic World is a theme park similar to Jurassic Park, created by InGen CEO John Hammond. 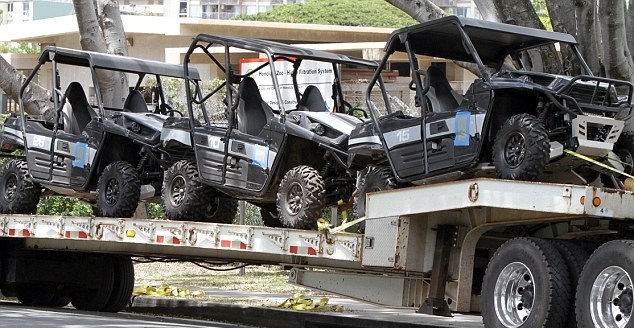 Props from the set of the eagerly awaited film were seen on location in Hawaii. Eager fans of Jurassic Park can now relish some spoilers about the upcoming Dinosaur movie which promises to deliver thrills equal to the first movie of the sequel. Jurassic World is expected to be set in the Isla Nublar Island and entertainment website cinemablend suspects that the sequel will begin 22 years after the events of the first movie. Eventually, the park workers get control of the bewildered dinosaurs and scientists allegedly use a fatal DNA cocktail to make the park more popular, but end up inviting more trouble instead. "In the two plus decades, the staff has apparently gotten complete control over the park, thanks in part to Chris Pratt's character training many of the dinosaurs. In an effort to make the park even more popular, however, the scientists allegedly decide to splice the dino DNA from a T Rex with a raptor, a snake and a cuttlefish." Entertainment website joblo.com reports that the upcoming movie will feature the notorious T-Rex and other raptors. There will also be the 'good dinosaurs' that help humans escape the wrath of the 'bad new ones' created by scientists as an experiment in Jurassic World. The fight between the giant creatures will be the high point of the science fiction movie. The upcoming Jurassic movie will be directed by Colin Trevorrow and will have Chris Pratt, Bryce Dallas Howard, Vincent D'Onofrio, Omar Sy, Ty Simpkins, Irrfan Khan, Ty Simpkins, Judy Greer, and Nick Robinson as its star cast.